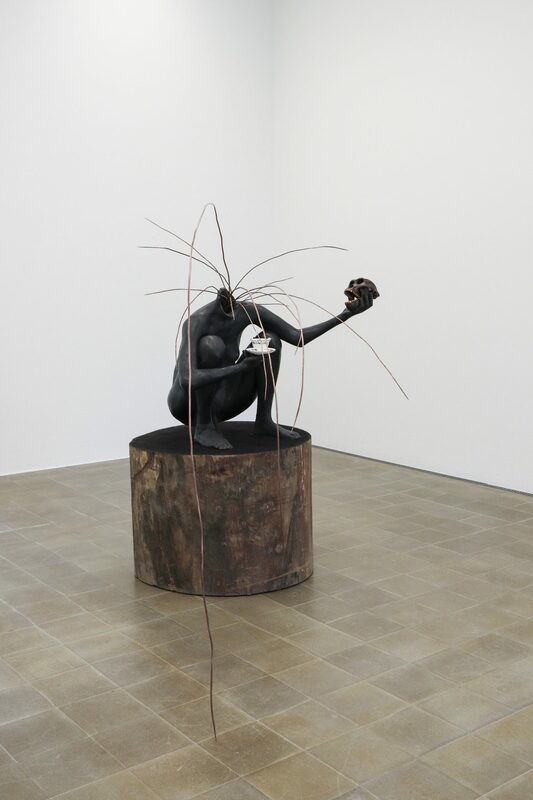 Bharti Kher (b. 1969, UK, lives and works in Delhi), works in a wide range of media, encompassing painting, sculpture, drawing and installation. Kher refers to her practice as a search for the chimera, the area between reality and illusion. She seeks visual clues and imagery from her daily life as well as different cultures, creating works that are radically heterogeneous. Often monumental in scale, her works map a tension of identities, social roles and gender. In the linking of the animal and human worlds the artist produces bodies as hybrid forms. Although Kher’s work appears to come from a distant world of fables and myths, it nonetheless takes a critical view of current social phenomena. A leitmotiv throughout her practice is the bindi: a symbol in India of the third eye and a popular fashion accessory. Kher uses it to connect the real and the metaphysical worlds and as a link between mind and body. Her iconographic bindi paintings reveal a personal, cultural and spiritual language that speaks eloquently about ritual and repetition and they appear to be a deliberate sign of resilience. Kher’s works reflect her position as occupying the female body and its fragility in different contexts. Her works touch on the precarious balance upon which our societies rest and suggest alternative and fantastical scenarios; a strategy perhaps for an age in the grip of political unease and historical anxiety. 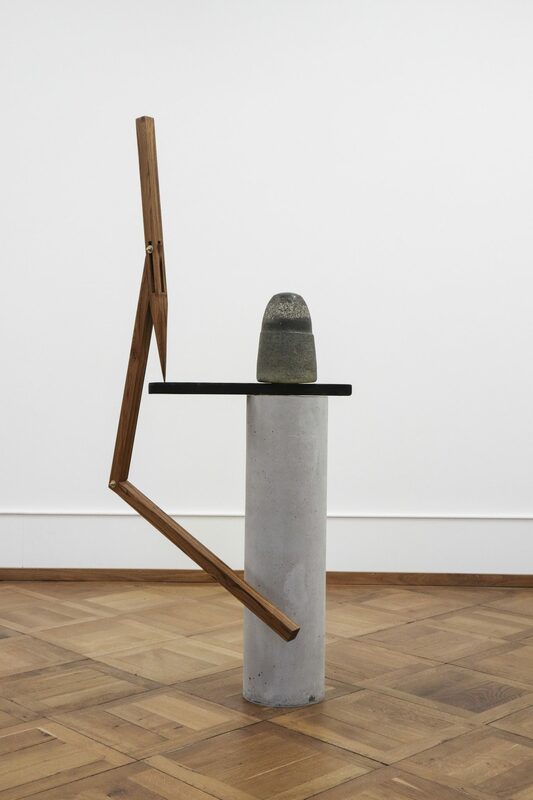 The exhibition at Kunsthaus Pasquart brings together key bodies of work in the various media that form Bharti Kher’s rigorous practice. Rather than conventional materials and techniques, she chooses to draw both her ideas and their means of execution from her daily life. As she herself has commented, an important aspect of this is her use of found objects; “I look everywhere and copy everyone—I am like a magpie that takes what it needs and turns an old shiny button into a beacon. Most of us are products of our lives.” The assembling of thousands of bindis produces highly textured surfaces on both paintings and three-dimensional works, while saris, although frozen into sculptures, retain the impression of fabric in movement. Kher does not, however, reduce such culturally specific materials to their geographical or gendered context, but rather expands their meaning so that the work becomes a metaphor for place as a lived and consciously created entity, rather than merely the marker of national or geopolitical identity. 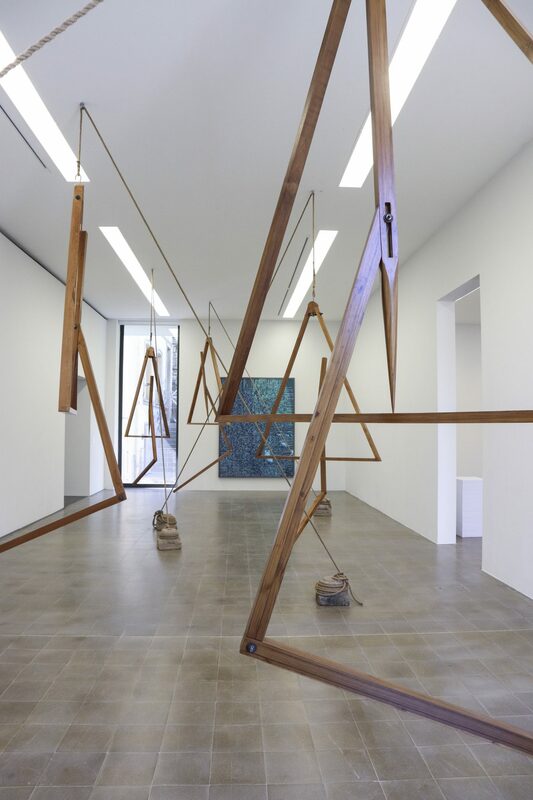 Important in this context are the found objects, particularly chairs and ladders, collected and combined by Kher to produce sculptures that create an equilibrium with their surroundings, both adapting to and affecting these. The work Three Decimal Points, of a minute, of a second, of a degree (2014), for example, was originally made for the Kochi Biennale but has to be activated in each subsequent location in order to move and adjust to gravity. 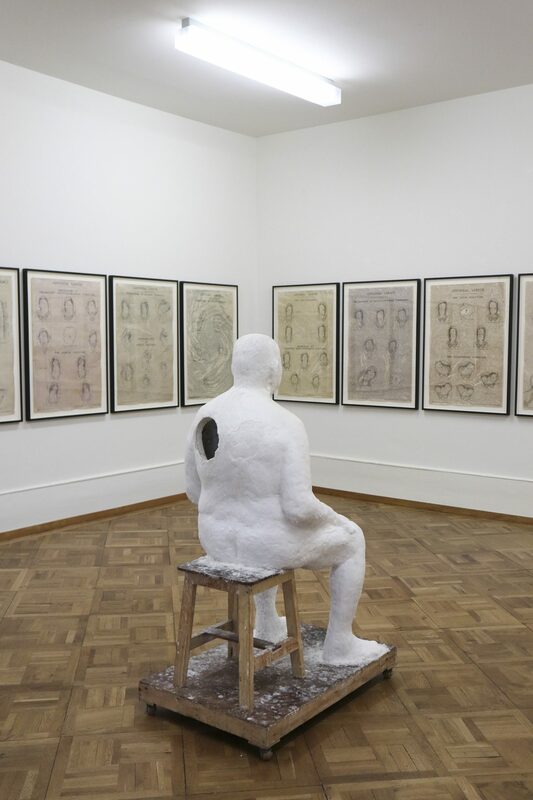 Even Father (2016), the monumental rendition of Kher’s father in plaster and wax, appears provisional, its presentation on a platform with wheels reinforcing the impression of place as a fluid experience. The bindis and saris, as well as the mirrors that also recur throughout her work, place the body – usually the female body – at the heart of Kher’s personal mythologies. She repeatedly confronts us with the woman as mother, monster, goddess, warrior, prostitute or mannequin. At times these women are naked, at others clothed, bearing the symbols of a range of familiar as well as obscure cultural systems. They have been hybridised into grotesque or threatening creatures, or systematically reduced to their anatomised body parts. Unsettled, bewildered, amused or shocked, we are asked to engage intimately with the artist’s subjects as powerful but at the same time vulnerable beings. Like the bindis that create the surface of animal bodies, such as the monumental sculpture of a whale heart (An absence of assignable cause (2007)), the skin that Kher applies to women’s bodies can be interpreted as both enhancing their identity through a kind of shamanistic energy and providing them with a fake covering. Kher’s investigation of how we might see and understand the body, what we know or don’t know, determines both her physical process of making art as well as the form in which her ideas are manifested. 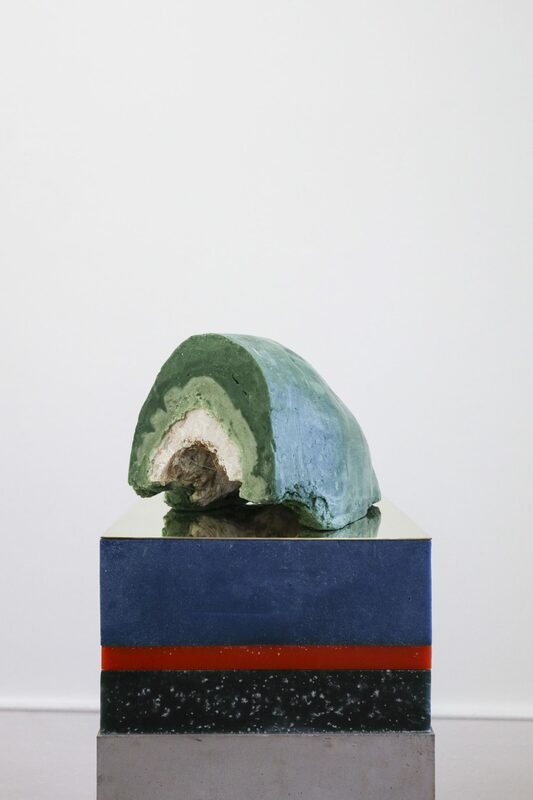 In the Chimera (2016) series, for example, the combination of casting, layering, mixing, covering and breaking open the plaster, wax and hessian fibre becomes essential to what the work is about: the uncovering, or a negative, of the inside of the human head or face, the outer features of which are hidden from our view. This process of making palpable the very essence of inwardness or interiority is also the theme of the series of gynaecological charts of women in pregnancy that were made in the 1950s. The recurring fractured mirrors, their surfaces disrupted by bindis, are an equally potent metaphor for the fragmented self, or the ambivalence of what it is to be a human. 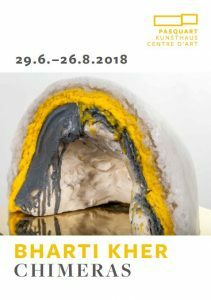 One of the most significant contemporary artists, Bharti Kher is presenting her first solo exhibition in Switzerland in Kunsthaus Pasquart. 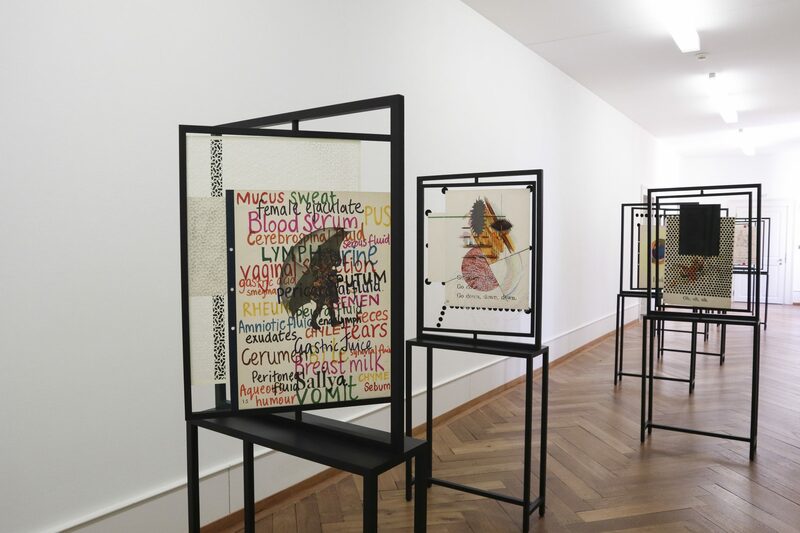 The exhibition is accompanied by a richly illustrated publication with texts written by Aveek Sen, Susan Silas and Chrysanne Stathacos published by the Verlag für moderne Kunst (DT / FR / ENG).